13 Bulky waste: Large items of waste material, such as appliances and furniture. Discarded automobiles, trucks and trailers and large vehicle parts, and tires are included under this category. Note this is the defined by state regulations and does not necessarily mean your program accepts all of these materials that make up this definition. 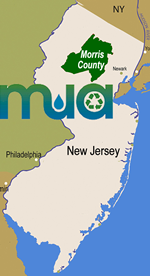 Waste Flow Control: If generated in Morris County, this material is required to go to the MCMUA transfer stations if it is being disposed. Note, waste flow control does not apply to recyclables that are source separated.